When the air gets crisp and the leaves start turning beautiful hues of red, orange, purple, and yellow, you may be tempted to go on fall foliage drives to see the amazing autumnal colors in all of their seasonal glory. But, before you hit the road, there are some autumn driving tips you will want to heed. While you may think that winter is the most dangerous season for driving (and in many respects it is, thanks to heavy snow, freezing rain, and black ice), autumn driving also has many hazards – some of the same that are also experienced in the winter. Fall is when leaves… um, fall. 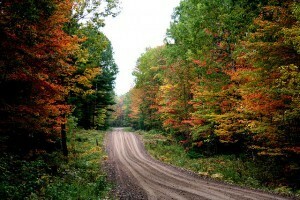 So, chances are, those color-vibrant roadways that you’re driving on during the autumn will be covered in leaves. Freshly fallen leaves can cause all sorts of road hazards. Wet leaves can cause your vehicle to slip — which is definitely not something you want to do when you’re driving on curvy mountain roads! Dry leaves can fly up under your vehicle and get lodged in tight crevices inside your chassis and other parts of your vehicle’s undercarriage. You’ll also want to avoid parking your car near a pile of leaves to prevent a fire that could combust when your vehicle’s catalytic converter kicks into action. Who knew leaves could be so dangerous? Autumn is when we ‘fall back’ with our clocks, so the end of daylight saving time means earlier sunsets and reduced visibility on the roads. Keep this in mind as you go on your autumn leaf travels, as driving on unfamiliar (and leaf-covered) roads after sunset can be hazardous. Be especially careful on curvy roads or those with steep inclines, and watch for other motorists as well as pedestrians and cyclists. Ice is especially prevalent in some parts of the country during the months of October and November, and even as early as September in high-elevation regions such as the Adirondacks and the Blue Ridge Mountains. You may want to equip your vehicle with snow tires (called ‘winter tires’ in the tire industry) before going on an autumn driving expedition, and be sure that your brakes and lights are functioning properly. Beware of black ice – transparent ice that may look like a little puddle of water or may not even be easily visible at all. Remember, bridges usually ice before the rest of the road (mainly because cold air can circulate both above and below the road deck), so be extra cautious when crossing a bridge during icy conditions. You’re on the road to look at leaves… and so are millions of others! That means millions of people will be stopping their cars intermittently, pulling over to the side of the road for those Oh-My-Goodness photo opportunities, and driving at slower-than-posted speeds to take in the autumn extravaganza. This can create a hazardous situation on the road for all drivers. So, be mindful of the other motorists on the road, and be sure to keep a little extra distance between yourself and the vehicle ahead of you, especially when you’re driving on scenic roads. A pretty clear giveaway of a vehicle to be extra cautious around would be one with an out-of-state tag. Before you head out on your autumn driving trip, be sure to take your car in for a basic inspection of its fluids, tire pressure, windshield wipers, brakes, engine, and other critical parts. Many autumn driving expeditions take leaf peepers on rural roads that are far flung from towns and cities. Even with the American Automobile Association (AAA) and other roadside assistance services available, a call for help when placed on a desolate highway 4,000 feet up on a mountainside may require waiting hours before a road crew shows up. Take good care of your car, and it should take good care of you!